is associated with a classifier such as a Class, Component or Sub-system (Actor) through the Select <Item> dialog. 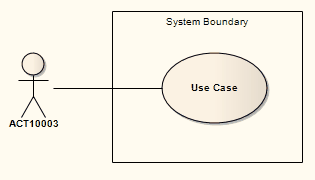 You can also define a Use Case as the classifier of a System Boundary element, to link the elements enclosed in the System Boundary (such as parts of an Activity diagram) to their representation in a logical Use Case. See http://www.sparxsystems.com.au/resources/map_uc.html. The following properties of a System Boundary can be set: the name, the border style, and the number of horizontal or vertical swim lanes. A System Boundary element can be marked as Selectable, using the element's context menu. When not selectable, you can click within the System Boundary space without activating or selecting the Boundary itself. This is useful when you have many elements within the Boundary and the Boundary makes their selection difficult. A System Boundary is the basis for the Image element, which enables you to add icons or backgrounds to a diagram, automatically displaying the Image Manager dialog from which to select the appropriate image.